Firstly, apologies this newsletter is a little later than usual. It does mean that Christmas is even closer and it is definitely time to start planning for the big day and we, at THHN, can help make this Christmas even more exciting than ever. Forget all about the man in the moon and big red lorries with fairy lights. You know holidays are coming when it’s Santa Sunday. Or if you can’t choose why not combine both in a Santa Duathlon. Every participant gets a Santa Suit to wear at the event (children’s and adult sizes are available). So join us and start your Christmas celebrations with this fun festive frolic. Huge thanks to Pennywell Farm for sponsoring the event. 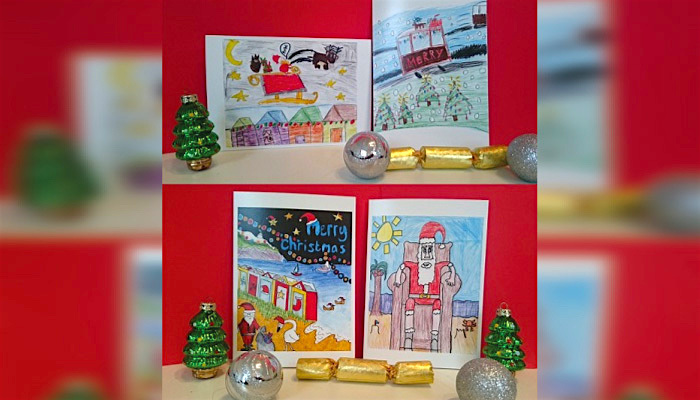 Last year we held a competition for children to design a Charity Christmas Card for THHN, with four lucky winners each having their design feature in our Christmas Card Packs. The lucky winners were Jacob Almond Abraham Thomas, Millie Etherington, Taylor Jane Weaving and Archie Tucker. We are delighted to announce that these cards are now available to purchase from THHN Memory Makers Children’s Charity Shop in St Marychurch. The cards are A5 and there are two of each design in each pack of eight cards, with envelopes included, and they cost £4 a pack. All the profits from the sale of the cards comes directly to THHN and will help us help even more families affected by serious illness and bereavement by giving them a free fun-filled memory making holiday. A very big Thank You to Babbacombe Model Village who sponsored the Christmas Card Competition. Following on from taking part in the City to Sea 53, Irene Hewings and her friend Debbie Drake decided to run a massive 350 miles from Torquay to Blackpool. Irene is 58 and Debbie 51 and they carried their own 15 lb back packs whilst running with no support, covering a distance of 25 miles per day, almost a marathon a day! The ladies arrived in Blackpool on 17th October. Irene and Debbie completed their challenge under their own steam with no support and completely out of their own pocket. Irene raised £425 for THHN You really are inspirational super women. Last year Yasemin Keskin fundraised for THHN by walking the London to Brighton challenge. Shortly afterwards, she took up running and last month headed off to Amsterdam to run her first marathon. It was a massive event with tens of thousands of participants on a very wet day but that did not stop Yasemin. She crossed the finish line in the Olympic Stadium in front of a crowd of thousands. On October 14th Memory Maker Man had a very special visitor when he welcomed Pippa Pig to our THHN Memory Makers Children’s Charity Shop this morning, she came to present a cheque for the sponsorship raised by the Pennywell Farm team who took part in our City to Sea event, two of the team came with her, proudly wearing their well-earned medals. They raised a fantastic £620. A big thank you to all at Pennywell for your fundraising and continued support of THHN. We were all very touched when Beryl came along to THHN Memory Makers Children’s Charity Shop today to present us with a donation of £250. It was Beryl’s 95th Birthday recently and she asked for people to make donations to THHN instead of presents. Her very kind gesture will help THHN give more families affected by serious illness and bereavement a free fun filled holiday, so they can gain some memories they will treasure forever. Thank-you so much Beryl. A very big thank you to all the Bishop Fleming staff who were involved with their big fundraising cycling challenge in September. Staff from all the offices joined together to cycle between the various Bishop Fleming offices, with some staff riding one stage and others cycling the whole route. The Torquay office chose THHN as their nominated charity. Tim Godfrey and Emma Rule from Bishop Fleming in Torquay came along to our THHN Memory Makers Children’s Charity Shop to present our fundraising Manager Brian with a cheque for £3,100 the amount they raised for us. Which is an amazing amount to raise for THHN. The money they raised will mean we can help even more families affected by serious illness and bereavement, by giving them a free fun-filled memory making holiday. The Downs Hotel, Babbacombe; Ashley Court Hotel, Torquay; THHN volunteer Holiday Liaison Officers Angela and John Bunce and everyone at their business Vomero Holiday Apartments in Torquay; Buckfast Abbey and everyone who contributes to a holiday at our fantastic Memory Maker Caravan. A huge and heartfelt thank you to the following businesses – Teddy Mountain UK, Halletts the Bakers, Luscombes Butchers of Torbay, Daisy Cakes, Riverford, Westcountry Fruit Sales and Claire’s Cakes, who have all donated delicious food hampers and gifts for the families to enjoy during their holidays in beautiful Devon! Of course, a huge and heartfelt thank you too must go to our amazing supporters, staff and volunteers who all work so very hard behind the scenes to ensure that THHN can deliver free fun filled, memory making holidays to families affected by serious illness and bereavement from across the UK – giving them memories to treasure forever! A very special thank you to whoever nominated THHN and to Herald Express editor Jim Parker and his team for putting on such an amazing event. Torquay United are putting on a Legends football match on Sunday Nov 29th in aid of Torquay United Players Fund and THHN. As well as the match THHN will be there with activities for children to enjoy on the day. Our meet the team feature will be back later this month so keep an eye on the website and facebook pages. Our next regular newsletter will be out in the usual time at the beginning of December. I can’t believe I am writing that word already. Where has the year gone?